Includes (3) Rectangular 72" x 30" Tables, (3) 60" x 30" Trapezoid Tables, (28) Olastic Chairs with Powder Coated legs, 4-Piece Play Kitchen, Pick-a-Book Stand, (2) 5-Section Coat Lockers, 20-Tray Cubbie Unit with Trays, Boockcase, & Storage Unit. No further description available. Additional shipping charges apply. Includes See-Thru Sensory Table, Science Activity Table, and Adjustable Mobile Bookcase. Table & Chair Set includes Flower Table, 60" Gray/Blue w/ Standard Swivel Legs; and 6 blue chairs, 18" high. 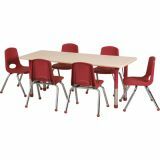 This classroom package has enough tables and chairs for your entire classroom! Package includes (4) 30x60 Rectangle HPL Tables with adjustable legs and (16) 12" hardwood chairs. This classroom package has enough tables and chairs for your entire classroom! Package includes (4) 30x60 Rectangle HPL Tables with adjustable legs and (16) 14" hardwood chairs. 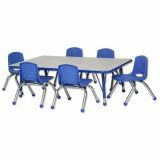 This classroom package has enough tables and chairs for your entire classroom! Package includes (4) 30x60 Rectangle HPL Tables with 18" legs and (16) 12" hardwood chairs. 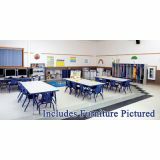 This classroom package has enough tables and chairs for your entire classroom! Package includes (4) 30x60 Rectangle HPL Tables with 20" legs and (16) 14" hardwood chairs. 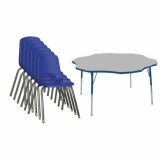 This classroom package has enough tables and chairs for your entire classroom! Package includes (6) 24x48 Rectangle Hardwood Tables with 18" legs and (24) 12" hardwood chairs.